Please scroll down to see all our compact computer workstations. Click on any desk to see more details & pricing. 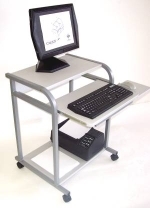 Our CUZZI line ranges from small 20" wide computer carts to 40" wide. This page shows compact home and office desks in the 20" - 26" width range. Also, three rolling adjustable height Pole Computer Workstations with a 24" footprint. For a detailed breakdown, check the blue column links on the left of any page.